Generally in all big hotels there are laundry facilities within the hotel. In small hotels or motels where owners don’t have big budget to purchase laundry equipment and enough space to run laundry operation, may use off-site laundry. They have to deal with outside laundry contractors. In our today’s mega tutorial we will cover everything you should know about laundering procedures in hotel housekeeping. A laundry pick up call is received by the housekeeping desk and informed accordingly to the Laundry valet on-shift attendants. The call is entered in the guest message register. The Laundry valet assistant goes to the room to collect the laundry and checks for the room no., total pieces and the type of service required. Care to be taken that the laundry list is filled and duly signed by the guest. This is then taken for Thermopatch (temporary marking) system for enabling guest room identification after processing and prior to fresh laundry delivery. This is sorted out as per the type of service required. All bags from the floors are collected at the guest section counter. Each bag is opened and the items are entered in the guest laundry register, for color and make. Marking is a process by which it is easy to identify and dispatch clothes according to room numbers after processing. The marker takes note of the fabric type before marking. Delicate materials like silk, polyester, muslin, wool are not marked on the marking machine. They are hand tagged carefully so as not to damage the fabric. While marking on the machine care must be taken to mark only on the inside seams of the garment. It is recommended to mark/tag on the double fold so that it does not damage the fabric when removing the tag/tape while packing. After completing the marking of one room laundry, only then can the sorter start with another bag. In case of express laundry and express pressing, the tags used are in gray color for immediate identification for the laundry attendants. The marker hands over the marked garments to the sorter. The sorter separates garments for pressing / dry-cleaning / washing and places them in their respective bins. Express laundry and pressing items are not put in the bins along with the normal guest load, but are personally handed over by the marker to the respective section attendants for quick processing. All clothes are segregated color wise and fabric wise. Clothes are also checked for burn marks, discoloration tears stubborn stains and pockets for any personal belongings or money. The sorter and the dry-cleaning unit also to check the guest clothes for buttons, which could be damaged during the dry cleaning process. In this case they are sent to the tailor for removing buttons before dry cleaning. The buttons are stitched back on the clothes before being ironed. The removed buttons are taken back from the tailor and placed in a clear plastic bag with a tag mentioning the date and the room number. Buttons that cannot be removed from the clothes will have to be covered and tied properly with silver foil before putting them for dry cleaning. The sorter sticks the express sticker on the laundry, dry cleaning, pressing slips for easy identification by the desk controller. The guest laundry attendant generates the bills as per the service used. After receiving the laundry and dry cleaning slips from the sorters of the different units, the laundry attendant bills individual rooms accordingly. Laundry attendant bill laundry, dry cleaning and pressing slips bearing express stickers immediately. Each bill number and amounts are mentioned in the corresponding slip and the first copy of the bill is then attached to the same slip. For any extra charges for express service, the laundry attendant must take care to enter the same. The second copy of all the bills generated in one day is sent to the accounts along with the daily summary sheet. The soiled uniforms are collected from the uniform department. A physical count is taken in front of the uniform attendant and the supervisor. All entries are made in the uniform exchange register. After the uniforms are brought to the laundry they are sorted color wise and fabric wise. The dark load is separated from the light and white load. Before the shirts are put for washing, the collar / cuff are dipped in the soap solution for around 15-20 mins. After they are removed from the soap solution the collar / cuff are scrubbed after applying the collar / cuff cleaner. They are then loaded in the machine for washing. Ensure that steam gun nozzle is clean and that the table is clean. Clean out the collection tray from under the perforated plate operation. Place stain right side up on the perforated plate. Remove garment from spotting table and send for further processing. Hand washing is done at the double sink with platform. Prepare a solution in one sink with 5 ml of clax star/ detergent in 5 lts of cold water. Segregate all hand wash clothes into whites light colored and dark colored garments. These are never washed together. Items in which the color bleeds or is likely to bleed are always washed individually. Dark garments in which color does not bleed are sent to the machine wash for further processing. Soak each lot separately for 5 -10 mins. Rub lightly with hands or use a brush. Rub gently if required and then rinse for 3 times minimum. Rinse in the second sink using clean cold water for all 3 rinses. Between each rinse excess water is removed by pressing the garment between the hands. After the final rinse, hang individually on metal hanger and place on the drying rod. After drying, segregate garments according to the fabric and give them for processing to the steam or the cotton press unit. All garments which do not need ironing are sent to the valet counter. Collect white, light and dark garment bins from the sorter area. Load the machine only when it can be operated at its optimum capacity and then lock the machine. Measure chemicals required into the appropriate suspenders. Program settings for different fabrics. After that, recheck if the door is properly locked or not. Depending on the wash load type (white, light colored) the washer is started setting it according to different programs. The washer should be monitored to ensure correct water levels, water temperature, proper draining and for any leakage. At the end of the wash cycle, the machine is unloaded. All the undergarments are segregated and sent to the tumbler for drying. All items for steam press are hung for air drying. All other items that are to be pressed are sent to the respective pressing units after drying. In case starch is added in the wash cycle or if color bleeding takes place, the washer must be rinsed thoroughly before being loaded with the next lot. Place all small delicate garments e.g. sweaters, ties, scarves handkerchief etc in a net bag before loading in the machine. Load the machine when it can be operated at its optimum capacity. Ensure that the door is locked before starting the machine. Three rounds of 5 mins each of dry cleaning. After each dry cleaning round, draining takes place for one minute each. After the third round of draining cycle, the extraction takes place for 5 mins during which maximum perchloroethylene is sucked out from the garments. The chemical solvent goes back to the solvent tank after each draining cycle. Drying of the dry cleaning garments takes place in the same machine after extraction. Fumes from the dry cleaning are harmful to the eyes and lungs on prolonged exposure. For this reason, it is imperative that the machine door is left closed at all times. 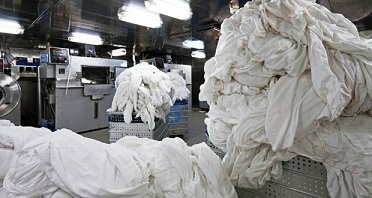 The guest articles, which are machine-washed, are put in the tumble dryers. In tumble-drying, clothes are segregated into light /white load and the other dark load. Load the machine only when it can be operated at its optimum capacity i.e. up to 1/2 of the machine glass door. Temperature maintained during drying is 70 degree. Drying cycle takes a total of 20 to 30 mins. Sets timers of 7 min. after initial drying open the door and check garments for moisture. Lock and reset machine for another cycle of drying which will completely remove all moisture from the garments. The time will vary from load to load taking anywhere between 3 – 7 mins. Machine is unloaded and all garments are sent to the valet counter where they are segregated and sent to different pressing units if required. It is important to clean the machine of all lint twice in each shift to maintain the efficiency of the dryer. All cotton and cotton blended garments are ironed using press unit. Press unit consists of two sub units. The press unit is first cleaned using a dry cloth duster and is feather brush. Leave the machine in open position. Ensure that there are no previous day’s clothes on the shelf or rack. Fill up spray bottles with fresh water for dampening clothes. Check for any guest pieces if left unpressed. Check with laundry supervisor for steam timing for running the cotton press. Receive all guest garments from the washer attendant. Clothes are segregated color wise into white, light colored and dark colored garments and a separate express load, and are kept in different pigeonholes. On receiving a call, the Housekeeping desk informs the Laundry valet on-shift attendant to collect the same. The Laundry valet attendant collects the same and brings it down to the Main laundry from where it is taken down to the Marking section. The laundry attendant will make out the bills. All items are collectively placed at the washing section. After the washing process the items are placed in gray bins. From the gray bin, the ironer picks up the garments; presses them and places them on the express section areas. Sweaters and cardigans are lightly steamed on the steam body press to remove wrinkles. Garments are segregated according to items; folded and then placed on racks. Before the garments are sent up to the guestroom, they are to be checked thoroughly for quality and finish. The attendants at the press units make first quality check. They check the garment for missing buttons, stains, zipper, replacement, trouser seams and any tears. The supervisor makes the final quality check, after the finished items reach the HK desk. As soon as all the garments in one laundry slip are processed and brought to the counter, the laundry slip against that pigeonhole is folded. The attendant picks out that laundry form and starts placing each item on the valet counter. He counts the pieces item wise checking the quality at the same time. He also picks out the garments on hanger and places them on the rod. Once all items are checked for quantity, they are ready for packing. Arrange scissors to cut tags. Laundry baskets of different sizes to be stacked. Freshly laundered cloth liners to be folded and kept in respective baskets. Keeps button replaced/zipper replaced card ready. Open the liner of the basket from all sides. Place the non-iron items first into the basket arranging them evenly. Then keep the pressed garments, placing the heavier ones e.g. jeans, trouser, shirts, first and then followed by lighter garments e.g. t-shirts, shorts, handkerchief, scarves. Close the cloth liner on three sides so as to cover the pressed garments and place the counter foil/laundry slip in the pocket of the fourth flap keeping the room number visible. Take a final look to ensure that the logo is facing the top. The button replaced tag/zipper replaced tag is put on the specific button of the garment while hanging or on the trouser of which the zipper is replaced. A tag is placed around the hook of the hanger mentioning the room number of the garment. Hangar shirts should be buttoned on the collar, the third and the last buttons. Coats to be buttoned on the first button. Skirts are hung on the hanger hooks by the hanger loops on the skirt. It is zipped and the button is secured. Trousers are hung sideways with the top belt area till the fork on one side and the trouser legs on the other to properly balance the trouser on the hanger. In a suit the coat and the trouser are hung together on the same hanger. Socks: Align toes, heels and leg bands together. Fold both together at the heel. Undershirt: Place right side down. Fold from shoulder lengthways on both sides. Make a five-inch fold at the bottom seam and fold over again in half. Brassieres: Fold in half at the center. Align cups. Fold in shoulder and back straps. Fold cups only in case of unpadded brassieres. Stockings: Align both legs lengthways. Fold in at the ankle. Continue to fold at every five-inch and align with the top band. All laundry baskets, which are completed, are placed on the valet counter. The supervisor checks the laundry slip in the basket for room number and number of hanger items. He enters the room number, the number of hanger items and number of delivery baskets in his valet slip. He places the basket and hangs the hanger items floor wise. The trolley once fully stocked is taken up to the respective floor. All the hanger and basket items of one floor are handed over to its respective attendants checking against the valet slip for the total quantity of baskets and hanger items delivered. The room attendant acknowledges the delivery by signing against the corresponding room numbers. In case of express laundry items, the same procedure is followed; only they are handed over individually within the specified time. All guest laundry to be delivered to the room not later than 8 pm.